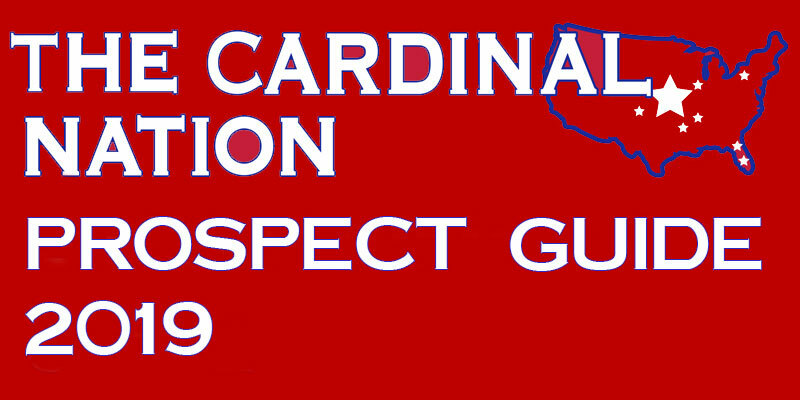 The Cardinal Nation has published rankings of the top prospects across the St. Louis Cardinals system since 2006. 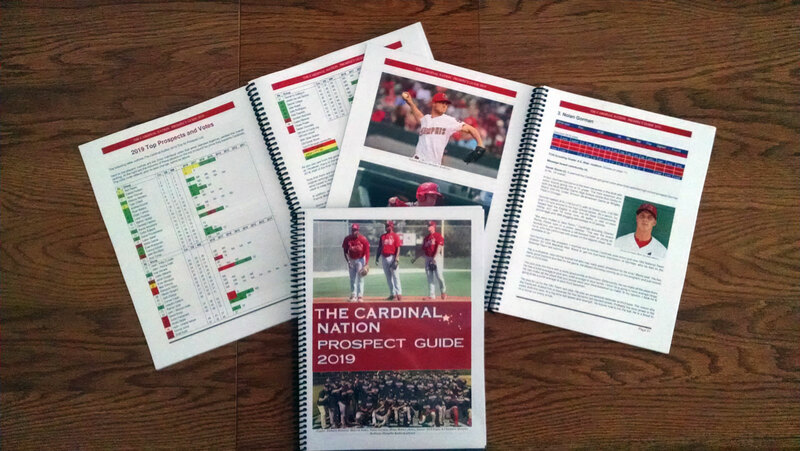 Again here in 2019, we have compiled all of these brand-new reports and much more information not available elsewhere into an eBook – The Cardinal Nation 2019 Prospect Guide. TCN owner Brian Walton and prospect analyst Derek Shore each extend their analysis to a group of others who missed the top 50 and both also detail their favorite sleeper prospect of 2019. This increases the profiled prospect count to 60. These prospect reports are fresh, compiled from information gathered while watching these players in action as well as from conversations with their coaches, Cardinals’ player development staff, scouts from outside of the organization and the players themselves. Additional views of the 2019 top 50 presented include tiers, an ultimate potential-only re-ranking, depth by position and prospect proximity to St. Louis. The Guide opens with a look back at the system’s all-stars and award winners from the 2018 season and concludes with an extensive Cardinals history section. The latter includes in-depth breakdown and analysis of the 2013-2018 First-Year Player Drafts and top international signings since 2004, including bonuses and spending against pool amounts. Also included are Rule 5 Draft results back to 2002 and our top prospect lists from 2006 on. Click here for the full Table of Contents or see below. 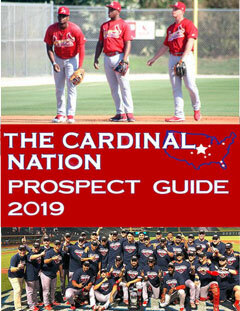 If you want to go deep on the Cardinals’ minor league system and learn about the next waves of prospects to reach St. Louis, the 2019 Prospect Guide is a must-have. Much of this information is available nowhere else and certainly not in one easy-to-access source. Get the Guide now and take it with you to spring training and to the Cardinals minor league ballparks all summer for insight on all the hottest prospects! The 2019 Prospect Guide can now be ordered in two different formats. Please ensure you get the one you want. The 190-page color Guide will be delivered in electronic form, via PDF. You will receive directions for access after your order is complete and verified – usually within two hours. There is also a limited edition print version now shipping. While we have ordered more copies this year, last year’s publishing run sold out quickly, so do not delay. The regular price of the 2019 Prospect Guide eBook is $19.95. It is delivered electronically, in PDF form. As a “thank you” to paid annual subscribers to The Cardinal Nation, you may purchase the eBook for less than half price – just $9.95. Note that this special offer is for the PDF version only. The costs associated with printing, binding and mailing preclude discounting the price of the printed version. Current monthly and three-month members who move to the annual plan will then be eligible, as are new annual subscribers. So, join today. Just click on the graphic at the right to get started. We reserve the right to cancel any non-qualifying discounted Guide orders. The 2019 Prospect Guide is now available and shipping in a limited edition printed version. This coil-bound, double-sided 8 ½ x 11 inch color book of 190 pages can be purchased for $34.95. USPS Priority Mail shipping to the continental US is included at no additional charge. If you live outside that area, please contact us before ordering for a price quote, or purchase the eBook version instead. Due to the fixed costs of printing, binding and mailing, no discounts are available on the printed Guide. When the print run is sold out, they will be gone – so do not delay! You do NOT need a PayPal account. Scroll to the bottom of the PayPal order screen to enter your credit card information as a guest. Your personal financial information is NOT saved, here or at PayPal. If you are ordering the printed version, please ensure you provide the postal address to where the Guide should be mailed. If you prefer not to use a credit card or PayPal to order the 2019 Prospect Guide, please contact us so we can make other arrangements. For those who would like a copy of last year’s Prospect Guide eBook, the 2018 version, it is still available at a price of $9.95, delivered in PDF form. The entire Guide has been updated for 2019. Every one of the 60 prospect write-ups are freshly written for this year. Full sections added the Guide for the first time in 2019 are noted below with “NEW”.